It's been a busy April for us so when Inferno Pizza Nottingham asked us if we'd like to pop down to taste their creations I reluctantly had to pass on reviewer duties to Mark. Here's his review of Inferno Pizza Nottingham. On first appearances you would be forgiven for thinking that Inferno pizza is a chain of fast food restaurants- and if you did, you would be wrong! Let me explain; Inferno is the first of its kind, the one and only, the original and has a truly unique outlook for a restaurant/ takeaway in the pizza business. What is more they do not plan for it to end there! 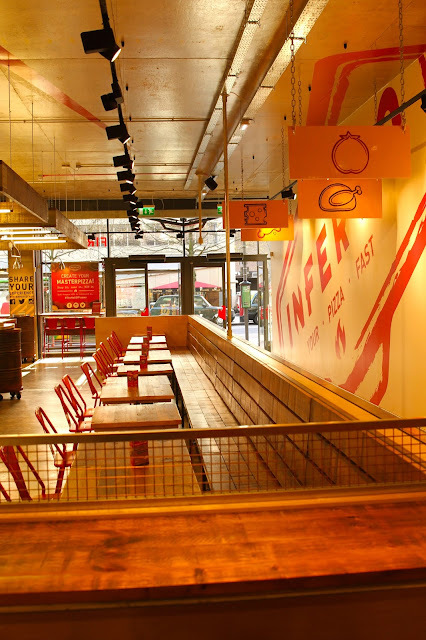 They are company in their own right (albeit with a stable and generous parent company) Inferno has grand ambitions and from what I saw of the operation there is such a huge potential to start a truly different pizza eating experience and one that will grow and grow. Situated opposite the back entrance of the Victoria centre, Inferno is a place where you can have the set choice pizza from the menu or you can have the freedom to CREATE YOUR OWN PIZZA!!! A marvelous innovation, I wonder why no one has really done this before! Wait a minute you say – you can go into a take away and add bits to a margarita or any other pizza on offer or ask them to take off those horrible anchovies! But all you’re doing is adding or taking away from the choices made for you. 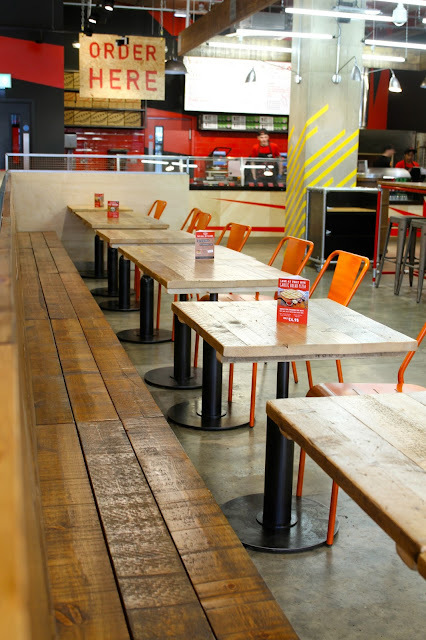 At inferno Pizza you can totally choose your style! Completely, without restriction! Sick of the basic sauce, change it to BBQ or one of the other base sauces on offer. Don’t like mozzarella cheese? So have goats cheese or blue or parmesan or a combination of any of the half dozen or more cheeses. Are you Vegan? Then pass on by to the toppings where there is ample choice of non meat products. 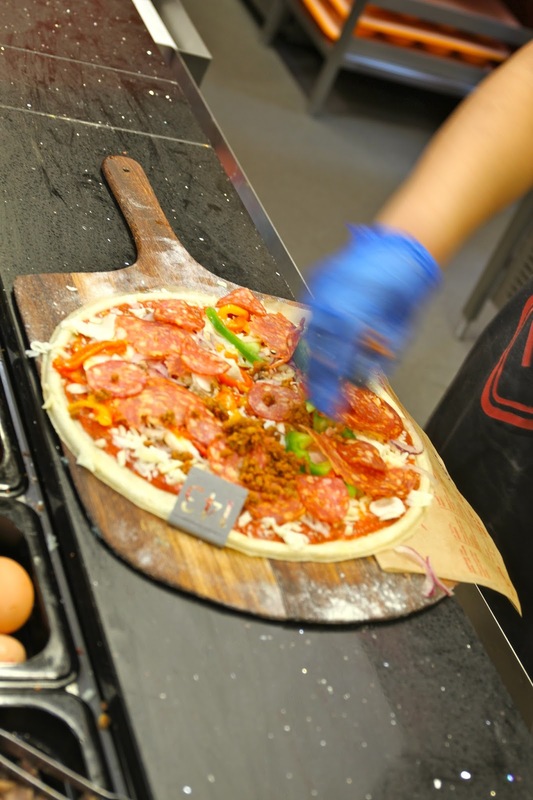 You've got toppings galore here, all the usual peppers onions, olives etc and not to mention a dozen or more meats. You can have whatever you want – and if that means EVERYTHING then you have over 50 items to put on your pizza!! Though don’t expect this to cook in 3 minutes!! The concept is simple, a choice of around half a dozen menu pizzas or a ‘make your own’ style if you want a free hand in creating something that you really want to eat. Having made your choice and created your desired pizza, you pay get your drinks and find your table and in 3 minutes your work of art is cooked and served how you want with different garnishes and sauces available. So knowing I can create my own pizza I set about creating my master piece, a wax paper liner records your order and name vital if at the end you’re to get the right food. You start with a really thin base pressed out to 10 inches or so these are prepared a few at a time so they are as fresh as possible. Then it’s the sauce, I chose the traditional as I like the base tomato sauce, then it was mozzarella and cheddar cheese followed by mushrooms, peppers, red onion, salami, pepperoni, spicy beef and bacon! My idea of a meat feast! By the time you get to the till your stood right in front of the oven and can see all the pizza’s cooking in front of you, you pay the £7.95 and head to the end of the long counter to select your ‘garnish’ in my case not being a fan of rocket I chose the Roquito sauce and a ‘help yourself’ pot of garlic and herb sauce. In 3 minutes my dinner was ready fresh hot and straight from the oven looking crisp and tasty. I get my plastic cutlery and I grab a stool. There is no doubt that the pizza looks good and smells good and that is as they say half the battle. So the base itself was very thin and crisp but not over cooked the toppings were very hot and the cheese nicely melted. It looked as good as any pizza I have had in Italy (I have eaten a lot of pizza in Italy over the years). The peppers were still a little crisp with a slight bite and crunch to them so not over cooked. The salami and pepperoni were what you would expect and the spicy beef was well spicier than I have had on most pizzas so this was a pleasant surprise. Now add to this the Roquito sauce – OUCH!!! This stuff is HOT, HOT, and HOT!! Well to me it was! It has a real kick and those who like chilies this is a good accompaniment (there is talk of using ghost or Naga chilies for an upgrade!! I think I’ll pass on that though!!) The overall taste of the pizza and worked equally well with the herb and garlic sauce as well. Over all, the toppings were fresh and at 6 pm when they have been open all day this is good news, quality produce kept fresh and looking like it was just put out for service adds to the attraction of knowing you have a quality product. In short it was a great pizza, full of flavor and surprisingly filling, more like traditional Italian than the Americanized deep-pan that most people seem to favor rather than the traditional thin base of Italy. I had a really good time the staff were really friendly and up for a laugh. Darren Lovells, the duty manager was very friendly, and for whom nothing was too much trouble. He answered many questions and was clued in on the company origins and where they were going. Also what was also nice to see Darren getting involved with the service working with the team doing what needed doing, all the guys seem to have a team mentality working together to achieve great results. I also had opportunity to speak to the operations manager Michael Johnson, again very friendly and really good talking to him about the company origins and direction. That Inferno has chosen Nottingham to pilot this new venture shows how much the city is growing in reputation as a place of great eating. While there I did bump in to an old acquaintance so I took the chance to get his thoughts on Inferno. I quote “It nearly became a bad habit!” he was getting to the point of almost being in there every day. I have spoken to many colleagues and friends who have ventured into Inferno all have said how good and enjoyable an experience it was. I truly believe the gem in this is the ability to pick whatever you want, all for the same price and know there is total freedom to do whatever you like depending on how you feel. In terms of price it’s not unreasonable for what I had I would pay a bit more from the local takeaway and it was not as good as inferno. Add the free refills on soft drinks and ice-cream (complete with sprinkles and sweets!!) this is a great place to eat.